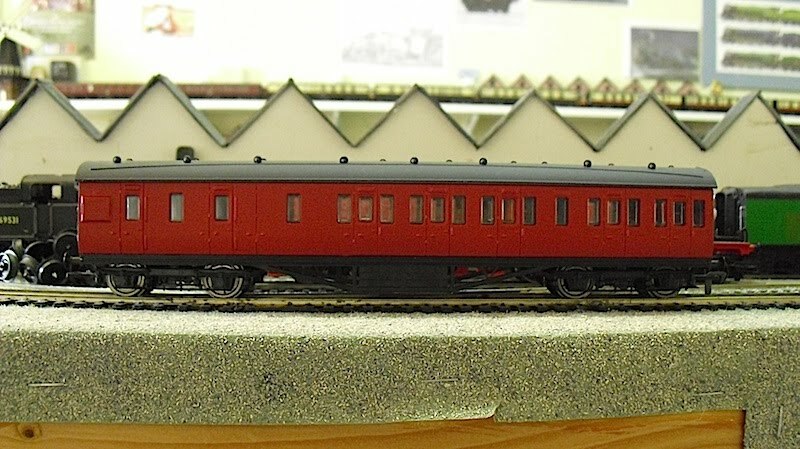 THE BRITISH RAILWAY STORIES LTD: "Midland Region Suburbans, Part 1"
The coach was disassembled into its constituent parts: roof, glazing, seating, coach body and frames. The lining and lettering on the coach body was removed using careful application of nail varnish remover, on a cotton bud. Wet'n'dry paper was used to clear up the residue. The coach was undercoated with a layer of white acrylic (Skull White), followed by cream (Bleached Bone), and a layer of my own Carmine mix on top, to match the GCR Clerestories. This was then sealed with Gamesworkshops' Purity Seal spray. The roof was painted separately, once again undercoated with a layer of Skull White, and finished off with Railmatch's BR Roof Grey enamel, after the acrylic had dried thoroughly after six hours. In retrospect, it hasn't actually changed the colour that much, and I am considering leaving this stage out for the other coaches. 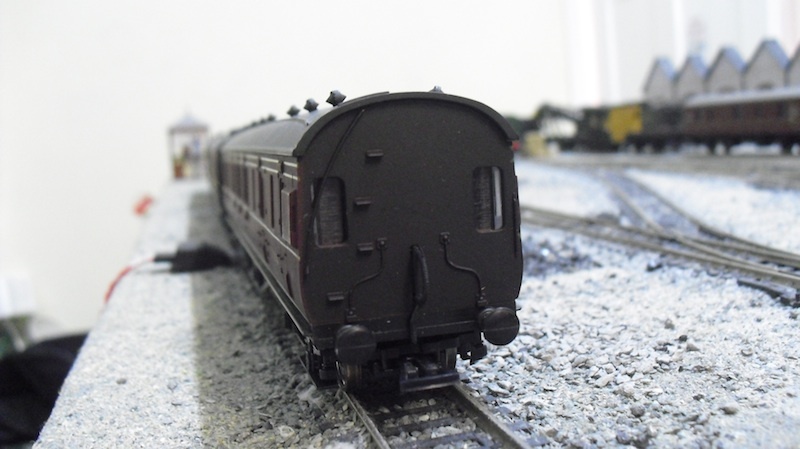 On the frames, the original plastic wheels were removed in favour of Hornby's standard metal disc coach wheels. Cheap, and simple to fit. I checked the back to backs and found one set that was out. This was carefully change with a pair of calipers and some pliers. The coach was then snapped back together. It is currently awaiting transfers - I now have another two to finish off in a similar manner. Until next time - where I hope to have all the suburbans in both the ex-LMS and ex-GCR rakes finished, complete with transfers and couplings.